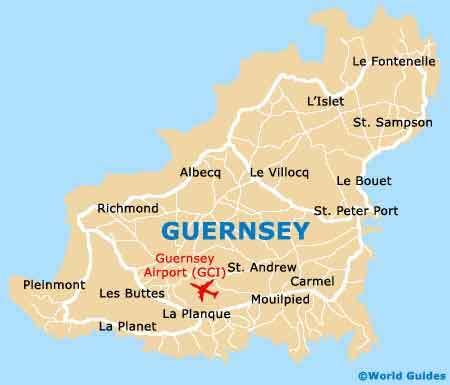 Many of the landmarks on Guernsey remain as important historical monuments to the past, with a number of impressive fortresses presiding over the coastline. 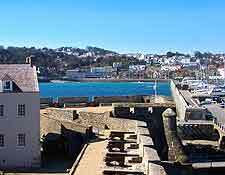 Castle Cornet is an especially imposing landmark and stands proudly over the breakwaters of the harbour of Guernsey's capital of St. Peter Port, being built on a former tidal island. The Pleinmont Observation Tower is a strong reminder of the island's Germany occupancy in the 1940s and this eye-catching coastal lookout tower comprises a total of five floors. 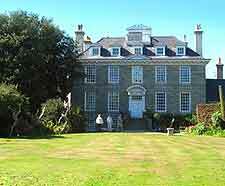 Sausmarez Manor is another particularly famous landmark on Guernsey and is actually the only stately home on the island that opens its doors to members of the general public. 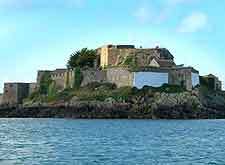 Castle Cornet is around 800 years old and houses no less than three different museums, filled with information about Guernsey and the castle's history. Guided tours of the fortress take place every morning, being followed by a gun firing display by soldiers dressed in period costumes. Outside, the formal castle gardens have been landscaped using only traditional plants and flowers. Refreshments are available at the Refectory Café, while a range of souvenirs can be purchased from the Castle Shop. 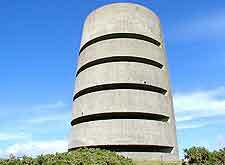 One of the most photographed of all Guernsey's landmarks, the Pleinmont Observation Tower was constructed in the Second World War by the island's German occupants. Dominating the island's south-western coastline, the Pleinmont Observation Tower is worth visiting, since the panoramic views from the very top are excellent. 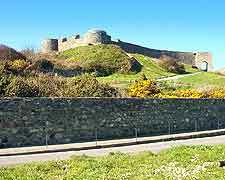 Sited on the northern side of Guernsey, Vale Castle is steeped in history and believed to have been built in the early part of the 14th century. Sadly today, all that remains of this landmark are ruins, the outer walls and also the ramparts. However, this is enough to picture just quite how grand Vale Castle once appeared, when it was used to defend this part of the island over the years. The castle fortifications and barracks are considered to be an important historical monument and each year in August plays host to the ever-popular 'Vale Earth Fair' music festival. Dating back as far as the 12th century and located in the parish of St. Martin's, on the south-eastern side of Guernsey, Sausmarez Manor has much to offer. Insightful guided tours of the beautifully decorated interior are always a highlight, as are the seasonal ghost tours, farmers' markets and plant sales. The striking creations in the adjacent Sculpture Park are always a pleasant surprise. In the summer months, Sausmarez Manor also offers train rides through the woodlands, and a popular nine-hole pitch and putt golf course. Purchased in the middle of the 19th century by famous French poet and playwright Victor Hugo, to prevent his eviction from the island, Hauteville House is today actually owned by the city of Paris. 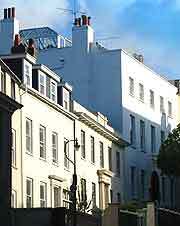 Built around 200 years ago and often referred to as the Victor Hugo House, Hauteville House is a large and hard-to-miss landmark building, with a bright white facade and breathtaking sea views from the gardens.